I picked up a copy of Eat: The Little Book of Fast Food by Nigel Slater. It has over 600 recipes for those times “you just want to eat” without futzing around too much. In addition to the sandwich I made earlier with chicken, avocado and an herb mayonnaise, I’ve also made marmalade chicken, a bacon and corn hash-like dish, and steak with miso sauce. I’ve bookmarked another dozen recipes to try. 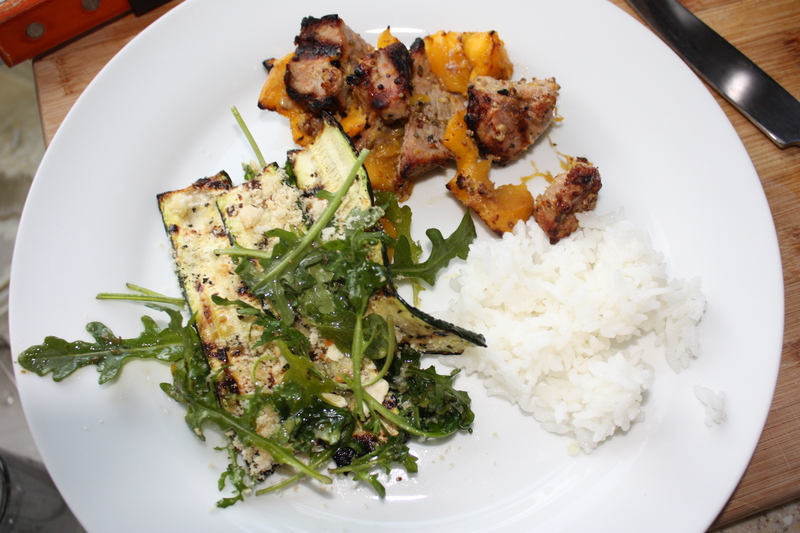 Saturday night I made these pork and mango kebabs. All you do is cut a mango or two into cubes, cut some pork shoulder into cubes about the same size as the mango and coat the meat with oil, a couple of tablespoons of whole-grain mustard, salt and pepper. Thread and grill until the meat is done. Don’t turn too often or the mango pieces will fall off. Squeeze a bit of lemon juice on before serving. Mmmm!